Tobie, a Bottlenose Dolphin at Sea World San Diego, gives birth! We seldom photograph in zoos or aquariums, except for pleasure, and our recent trip to Sea World, San Diego was a real pleasure! We were able to go “behind the scenes” to see Tobie, a Bottlenose Dolphin, two days before she delivered her fourth calf. On October 18, 2015, she delivered a beautiful, healthy 40-pound calf. It will take several weeks until the experts can determine whether this calf is male or female. The moment Tobie saw us enter the “behind the scenes” area, she found her toy and flipped it up in the air, then grabbed it and raced toward us, reminiscent of the family dog wanting to play. She looked like she was doing very well, and this is fantastic news! Sea World does an awesome job with all of their animals, and you would be hard pressed to find others with such dedication. Captive breeding is an important part of the conservation of species, including sea mammals, and Sea World should be given kudos for their many success stories. Those successes are not by accident, but rather, the result of years of very hard work by many dedicated people. 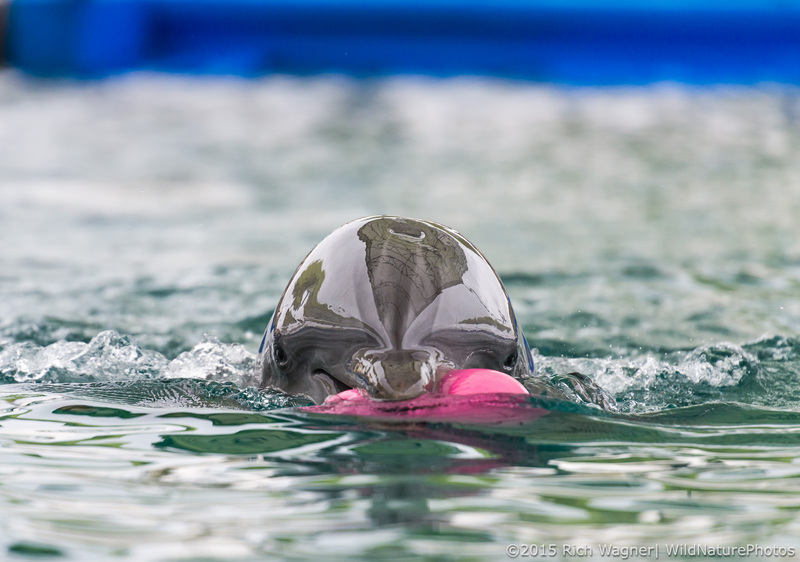 Tobie, a Bottlenose Dolphin at Sea World, San Diego, 2 days before she gave birth to her fourth calf. Congrats to Tobie, Sea World, and the incredible vets and dolphin trainers (Susan M, thanks!!!) who put their hearts and souls into helping these wonderful animals. And yes, I got really nice photos of her. Congratulations to Tobie with the birth of her new baby!